Indicators of health system coverage and activity in Ireland during the economic crisis 2008–2014; From ‘more with less’ to ‘less with less’ by Sarah Burke , Ireland. Sarah will as economist and commentator draw on quantitative and qualitative data collected as part of the Resilience project which monitored what happened in the Irish health system during the economic crisis of 2008-2014. Interactive working session based on a co-operative research study (first presentation of research outcomes) by Suzanne Rutz of ‘Samenwerkend Toezicht Jeugd’ (Joint Inspectorate for Youth) in the Netherlands and Dinah Mathew of the Care Quality Commission in England. The topic is the way that inspectors’ discretion is structured through organisational routines and through collective work within and outside their organisations. 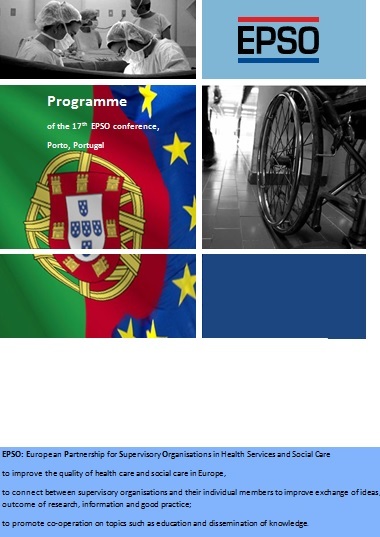 The study will be used to prepare for a cross-border discussion between EPSO members on this topic at the 20th EPSO conference in Finland (Autumn) 2015. The Estonian Pilot of the Restraints and Coercive Methods working group to test the EPSO Assessment and Evaluation Framework in long term nursing care, psychiatric wards and various hospitals in in Tartu, Valkla and Rõngu, in Estonia. Presentation of the Final Report of the Estonian visit and plans for follow up by the EPSO working group on restraints and coercive methods. 12 Estonian Pilot - main findings ,the use of psychopharmacological medicines and possibilities to improve by Rosemary Smyth. Click here for the short report of this conference. Doanload here the most recent participants list of the Porto conference. • New challenges for regulatory and supervisory organisations: What are the main changes in health systems under financial and economic stress? • Financial Risk, financial and management indicators: financial problems in the social care sector seem to have serious impact on the quality of healthcare and the qualitative results of health care institutions in this sector; if this indeed proves to be the case, this finding could help supervisory organisations with early detection and risk selection of quality failure in the health sector. - Regulatory approaches to such problems. • Forum discussion on Economic Regulation and Financial aspects of Inspection . • Planned activities of the EPSO working group on Risk management Current state of affairs and recent developments in the area of Risk management and Risk indicators. • Focus on risk indicators: The SINAS (quality ratings) project by the Portuguese Health Regulation Authority. • Follow up survey regarding Media and Supervisory Organisations (current state of affairs): Impact enhancement and damage control through media management by supervisory organisations. • Social media and Supervisory organisations: added value of ‘social media’ in health care based on a recent research study. The Estonian Pilot of the Restraints and Coercive Methods working group to test the EPSO Assessment and Evaluation Framework in long term nursing care, psychiatric wards and various hospitals in in Tartu, Valkla and Rõngu, Estonia. • Introduction to the Estonian pilot; First Results. 1. How to find the best incentives for excellent co–operation between hospital boards and health inspectorates/ regulators in hospital care? 2. What should be the main objectives and future goals for health inspectorates health inspectorates and inspectors to promote excellence or at least the best possible care, including excellent quality and safety systems in hospitals, the best possible care for users of hospital care and to prevent hospitals from qualitative decline by neglect of critical factors or overlooking important aspects of good governance and effective management in hospitals? 3. Which road leads to mutual understanding between hospital directors and inspectorates or regulators and which road leads to mutual challenge to promote the best possible hospital care? 4. How to find the best incentives for excellent co–operation between hospital boards and health inspectorates in hospital care?